It is clear that since the 2017 General Election, the political narrative, the overall feeling within the country, has changed. Looking past the never-ending debate about Brexit, something has become clear, and that is that the country is fed up with money being wasted whilst essential services languish. Hopefully, this will mean that there might finally be some proper scrutiny of HS2 and transparency about what is actually happening with the project, as there is no better example at the moment of a project that is ‘For the few’. Simply put, HS2 is a project we don’t need, that won’t deliver on its’ promises, that comes at a massive cost economically and environmentally, that is simply the wrong project and was decided upon without any assessment of whether it was the right thing to do or not, and something which will only benefit the richest in society, with ever increasing costs at a time of cuts everywhere else. 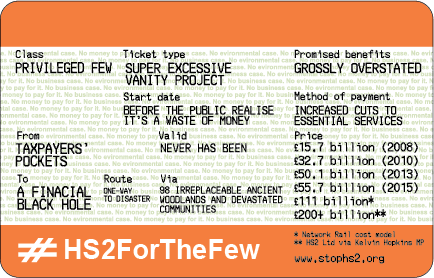 The few HS2 is for is those few who will afford to be able to use it, and those few construction firms headed by the ‘High Speed Rail Industry Leaders Group’ which have lobbied so hard for it to be built. Originally touted to cost the taxpayer just £15.8bn in 2008, a cut back version of that first proposal now stands officially at £55.6bn (2015 prices), with unofficial estimates putting the cost much higher and which many things that are seen as ‘essential’ for HS2 to work kept off the books. Because it has been so heavily lobbied for by the firms that want to build it, HS2 has suffered from the worst possible thing a project can have in the UK, cross-party support. With the construction lobby fabricating a case for the project to suit their own ends, politicians have ignored all the independent scrutiny and happily repeat justifications for the project based on soundbites without substance, simply saying things like HS2 is ‘essential’, and it is a ‘once in a generation opportunity’. So what is repeatedly touted as the largest infrastructure project in Europe has not had any real scrutiny, let alone the level a project of such scale should have. So when there has been in-depth and continual criticism of the project from the likes of the National Audit Office and pretty much every independent economist, as well as scores of rail professionals and environmentalists, this has simply been dismissed. All of this is against a backdrop of HS2 being officially the worst project on the Government book, having been rated ‘amber-red’ five years running in the annual report of the Major Projects Authority (previously IPA), which means the project is in danger of failing, but HS2 Ltd have simply stayed in a constant cycle of saying everything raised in these reports has been sorted out, before the next one rates them as amber-red again. Government has kept refusing to publish these reports and even when they are forced to by the courts, all the important stuff is redacted. Whatever the type of Government report on HS2, we constantly find that all references to the actual costs and timescales they are working to have been removed on grounds of ‘commercial confidentiality’, but despite refusing to publish any of these details, Government insist HS2 is ‘on time and on budget’. While Proponents will now say HS2 is about jobs, ‘rebalancing the economy’ and ‘changing the economic geography’ of the country, the reality is that HS2 is a Ponzi scheme, designed to make money for the construction giants (including tory donors and union blacklisters) who lobbied for it to be built. In terms of a job creation scheme, it’s absolutely terrible. With the official cost at £56bn and there being a forecast of 27,000 construction jobs, that works out as over £2m to create one single job. And many of these won’t be ‘new’ jobs, but people transferring from Crossrail to HS2. In terms of ‘rebalancing the economy’ and ‘changing the economic geography’, this is the perfect example of the fact that the entire case for HS2 has been made up and is being promoted in soundbites by people who know absolutely nothing about HS2; every single piece of international evidence shows exactly the opposite will happen, more economic activity will be drawn to London, and the commuter belt will be extended for those who can afford it. If the object of the exercise is to create economic regeneration in the North of England, the very last thing you would do is build a quicker railway to London, you would spend the money where you want the growth. About the only other argument for HS2 still standing is that it’s needed to release essential capacity for local passengers and freight. While it is impossible to say HS2 won’t deliver capacity, but it would deliver it where it is needed least, with the minimum flexibility and interconnectivity, 20 years in the future, at the highest cost both financially and environmentally. The vast majority of rail passengers are not the inter-city business elite, but short-distance commuters who will continue to face crush-hour conditions as HS2 hoovers up the rail infrastructure budget for decades to come, as is already happening with the cancelation of electrification programmes. Whilst politicians are keen to say ‘HS2 will free up capacity’, what that means for many towns and cities that are intermediate stops on inter-city routes is losing the trains they currently have. You cannot do one without the other, and there is a requirement for £11bn worth of cuts to existing rail services in the latest HS2 business plan. Like the costs, these projected cuts have doubled since HS2 was first proposed and will most certainly keep going up. 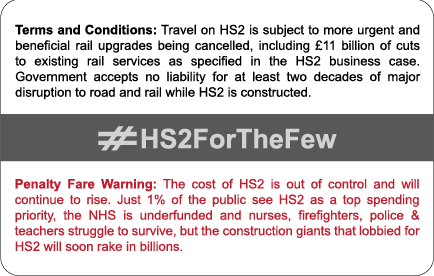 Given all these inevitable consequences of HS2, it is amazing that ASLEF & TSSA, rail unions which are very influential in Momentum, cannot think beyond the concept that HS2 is investment in rail, so it must be a good thing. Politicians have said that if a new railway line is needed, it ‘might as well be high speed’, because it only costs 10% more. So what they are saying is we ‘might as well’ spend an £6bn, and ‘might as well’ have a new railway that won’t have intermediate stations, we ‘might as well’ have a railway that will cost more to run and maintain, we ‘might as well’ maximise the damage to communities and the environment because it has to go straight, it ‘might as well’ not connect properly with the rest of the network, and it ‘might as well’ not carry freight. Put simply, building HS2 is like building a straighter copy of the M1 from London to Leeds & the M6 to Manchester, charging more to use it, banning all lorries and only having junctions at Birmingham, Crewe, Nottingham & Sheffield. We have had high speed railways in the UK for 40 years, it’s just that they haven’t been dedicated solely for high speed, they’ve been mixed use so we’ve got the most out of our railways. Duplicating existing railways without even assessing the alternatives is not progress, is closed mindedness as HS2 is a 19th Century solution in a 21st Century world. There are all sorts of current and possible future innovations in travel which will make HS2 look out of date before it is built, by the insanely obvious point is that to have an economy fit for modern times, surely investment in high speed broadband in more urgent. HS2 will require an immense amount of energy due to the speeds involved, and all calculations about the carbon footprint have ignored the embedded carbon from construction, and because of the speeds involved HS2 has to go reasonably straight, maximising the damage to the natural environment. For a sustainable future, instead of getting ever more people to commute ever greater distances, we need to create jobs where people actually live. Proponents of HS2 will say that it is too late to stop HS2 as it’s already being built, but this is another part of the spin. Construction of HS2 is 2 years late, so to try and pretend that construction is on time, Government has decided to rebrand the enabling works such as demolitions and moving utilities as ‘construction’. Two-part design and build contracts were signed for Phase 1 in July 2017, with the design bit expected to take over a year and see revisions which will again significantly increase the projected costs. Despite all this, politicians still insist HS2 is ‘on time and on budget’, whilst refusing to publish the timescales and budgets that are being worked to. But what this does show is that until construction is due to start in a year, maybe a year and a half, it can still be stopped. So please help us trying to get it stopped and sign the petition. HS2 must be abandoned. A completely unnecessary vanity project lining the pockets of a privileged few to bring great misery to many hundreds of thousands. Stop it NOW.